"Crew was Charlie, Nick and Giovanni"
A Customer called in from Union, NJ looking to get a permanent solution for the chill they could feel coming from the attic. Our comfort specialist, Rob came out to take a look at the current situation. After some questions to the customer in regards to what’s going on and what they are looking to accomplish, Rob was able to come up with the perfect solution. He knew that Dr Energy's SupeKneeWall was the perfect fit. Charlie and Gio came out and installed it in no time. Customer called back the next day to say they had a noticeable change in just their first night with the product. Our leading Electrical technican at Pipe Works Services, Ryan, was dispatched to an estimate to install recessed lighting for a customer. Ryan removed the existing center lighting and lighting over the sink and installed 6 new, more efficient lights with dimmer capabilities. Main sewer line clogged. Will need the plumber to snake the line. No proper supply of heat in one of the bedroom in first floor as well as second floor. Thanks Mike. I always appreciate your excellent work and efficiency. At Pipe Works Services, Inc. we are proud to serve our area because we put customer service above everything else. Our trained technicians use only the highest quality materials from the best manufacturers around, ensuring quality & long-lasting results for your home. We want to help find the solution that will work best for you! We know that plumbing isn't something that most people think about until something goes wrong. When pipes freeze, crack or begin to leak, then we are the contractor for you! No job is too big or too small and we can provide reliable, quality repairs and replacements so that the job is done right the first time. Our team of plumber technicians are ready for your call to fix your plumbing problems. Pipe Works Services, Inc. is regarded as one of the best plumbers in Union, NJ, so you can rely on getting the job done right the first time! A common problem with water that comes into your home or business is that it is "hard" water, making your water heaters work harder than they need to. This compromises the ability of the heaters to clean your dishes and clothes the right way, leaving the chance for bacteria in water to cause illness. Trust the experts at Pipe Works Services, Inc. to provide water conditioning and water treatments that will ensure your water is clean, safe and healthy. 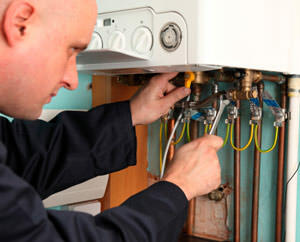 Pipe Works Services, Inc. isUnion, NJ's trusted water heater repair, replacement and service provider. We have a long history of helping homeowners with all their water heater service needs, whether gas, electric or any other kind, we can help. When it comes to water heaters, we only offer our customers the best. At Pipe Works Services, Inc., we understand that you need the best at an affordable price! If you are looking for a water heater repair, replacement, or service cost estimate, contact us today for a quote! Rheem water heaters offer homeowners the highest quality in the industry, and at Pipe Works Services, Inc., we are proud to be a certified Rheem water heater services contractor. When it comes to water heaters, you can rely on Rheem to not only last for many years, but work efficiently, especially the 75 gallon Rheem water heaters. If you are looking to install a new or service an existing Rheem water heater, contact Pipe Works Services, Inc. today for a FREE service quote! Pipe Works Services, Inc. provides air conditioning repairs and installation. The best way to avoid a problem with your air conditioning unit is to have it checked and serviced regularly: this way, we can nip any serious problems in the bud. You don't want to be stuck with an air conditioning problem when you really need it in the summer, so count on us to make sure that your home is comfortable and cool! Along with air conditioning, Pipe Works Services, Inc. provides homeowners of Union and Union County reliable heating services. We understand that winters here can get very cold, and we want to make sure that your home is comfortable year round. We offer repair and replacement for all types of furnaces such as gas and electric, boiler replacement and repair, heat pumps and much more. If your home isn't as warm as you would like it to be, contact the home heating repair experts at Pipe Works Services, Inc. today! Your home can lose heat easily through gaps and cracks in floors and ceilings. When hot air rises in the winter and escapes through a poorly insulated attic, then new air is drawn in from the outside through the basement or crawl space. This cold air is then circulated throughout your house, causing your heating system to work overtime and your home to be uncomfortably cold. 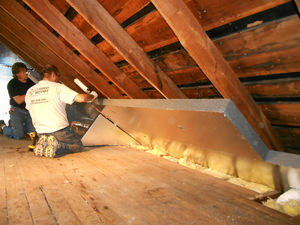 The way to prevent this is to insulate your home, the attic and crawl space in particular. Additionally, air sealing your home is important because our experts can pinpoint the cracks and gaps that air is leaking through, making your home more energy-efficient. Our SuperAttic system can professionally insulate your attic so that it does not allow heat to escape through it in the winter and control heat in the summer. If you are looking to improve the comfort of your home, you can count on Union's trusted insulation contractor to solve your insulation issues. If you're looking for plumbing, HVAC, electrical services and more, Pipe Works Services, Inc. has the tools and the expertise to keep your home cool, clean and comfortable all year-round! Let our team of friendly, knowledgeable staff and certified technicians work with you to find the solution that will work best for you and give you quality, long-lasting results! Call us today for a FREE estimate! Pipe Works Services, Inc. provides expert electricity repair, installation, and energy-saving upgrades for homeowners in Union. Whether you need interior or exterior lighting upgrades, emergency electrical repairs, or generator services, we have these solutions and more. Is your electricity as energy-efficient as can be? Schedule your free, no-obligation service estimate and find out today! Customer called in looking to get a permanent solution for the chill they could feel coming from the attic. The technician found pilot light out. Relit and tested operation, tested ok. Left running normally at this time. Customer states Humidifier is running all the time. Upon diagnosis found that Humidifier had new wires from installation it was wired incorrectly, it was wired to a constant 24v source, and not to the HVAC equipment, re wired and tested system operating properly now. Front exterior wall of home- Upgrade 2'' x 4'' wall insulation with dense-packed TruSoft cellulose insulation by drilling multiple 2 1/4" holes in wall from the inside, dense packing each cavity with TruSoft cellulose insulation then plugging and patching each hole with one coat of spackle. Painting is not included. - Right exterior wall- Upgrade 2'' x 4'' wall insulation with dense-packed TruSoft cellulose insulation by drilling multiple 2 1/4" holes in wall from the inside, dense packing each cavity with TruSoft cellulose insulation then plugging and patching each hole with one coat of spackle. Painting is not included. Need inspection of dryer vent and chimney ASAP for Condo HOA. HOA is requiring inspection report and certificate of insurance naming the condo HOA as an additional insured. I have already had these inspected and cleaned however previous contractor never provided report or certificate of insurance. I want to change my oil furnace to gas. I also need to change my AC unit condensor. My cooling system is currently leaking due to condensation of HVAC. It's possibly causing problems to my downstairs neighbors' ceiling. House Front Hallway Very Cold and Crawlspace in basement underneath for potential insulation. Also the room above the garage is very cold. Thanks. Brown water can be seen on top of the tank and the water heater tank needs to be flushed. The water heater is a 50 gallon Rheem product and was installed 3years and 4 months ago. At the present time the water heater works fine. I need an estimate to insulate my attic. Thank You.